Tao Te Ching is the cornerstone of the Philosophical Taoism, and is one of the defining books to both, the Chinese Buddhism and Religious Taoism. This workbook contains all the teachings and poems in this classic without the numbers that were added only after the creation of the original Tao Te Ching by scholars, and as it encourages the readers to write their interpretations of the teachings, the books creates a deep contemplative atmosphere for readers, and gives writing tips to enforce the creative process when filling the spaces for interpretations. 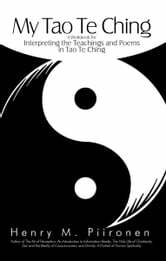 This is a book for all those who seek deeper understanding on the nature of Tao, in the spirit of the universal human a part of the demystified series. The Tao that can be trodden is not the enduring and unchanging Tao. The name that can be named is not the enduring and unchanging name. (Conceived of as) having no name, it is the Originator of heaven and earth; (conceived of as) having a name, it is the Mother of all things. Always without desire we must be found, if its deep mystery we would sound; but if desire always within us be, its outer fringe is all that we shall see. Under these two aspects, it is really the same; but as development takes place, it receives the different names. Together we call them the Mystery. Where the Mystery is the deepest is the gate of all that is subtle and wonderful.